I reviewed Emergency Contact (Simon & Schuster Books for Young Readers) by Mary H.K. Choi for Lone Star Literary Life. This YA novel is a compulsively readable debut—tender and awkward, sweet and sad, and lol funny. Penny is eighteen, beginning her freshman year at UT Austin. She’s funny, smart, and curious (in both senses of that word). She’s an anxious introvert who “would rather eat a pound of hair than reveal her true emotions,” highly organized, and a bit of a germaphobe. Penny, “living in books until the exciting part of her life could begin,” can’t wait to get away from her mother and her hometown boyfriend and begin her life as a science-fiction writer. Sam is twenty-one with “irresponsible hair,” managing the Coffee House where he’s famous for his mad baking skills. He wants to be a documentary filmmaker but had to drop out of college because he couldn’t afford it. A bit adrift, Sam is lonely, lives on a mattress upstairs at the coffee shop, trying to remain sober in the face of despair and “gutted” by a broken heart. Penny discovers Sam as he’s in the middle of a panic attack on 6th Street (“a Disneyland Main Street for day drinkers”), and they exchange phone numbers in case of emergency. 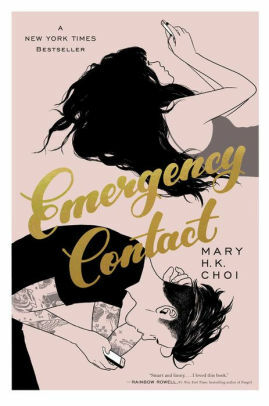 Emergency Contact is the first novel from Mary H. K. Choi, who grew up in Hong Kong and Texas. Choi writes for the New York Times, GQ, Wired, and Atlantic. She has also written comics for DC and Marvel and published a collection of essays called Oh, Never Mind. Choi hosts the “Hey, Cool Job!” podcast and is a correspondent for HBO’s “VICE News Tonight.” Emergency Contact is a compulsively readable debut—tender and awkward, sweet and sad, and lol funny. This fast-paced story is told through the alternating third-person narrations of Penny and Sam, two compelling, complex, flawed characters with satisfyingly detailed backstories. Choi employs an evocative economy of words. She dives into devices and social media, arguing that the generation coming of age now is not emotionally stunted, even if they do use emojis—emotional shorthand. Penny and Sam are sharing themselves in what they consider to be a safe space, even if that space is an iPhone. “They could get to know each other completely and get comfortable,” Penny thinks, “before they had to do anything unnecessarily overwhelming like look at each other’s eyeballs with their eyeballs.” The dialogue flows smoothly, even when things are, like, so awk. Penny nodded a third time. “You know you can tell me anything,” said Jude. Penny regarded her roommate’s big sorrowful eyes and knew it to be true. “I’m going to hug you now,” Jude warned. I spent a good deal of time lying about and smiling while reading Emergency Contact, forgetting to take notes. Penny and Sam are workshopping life, and I’ve become so fond of them that I wish I could check in on them to see how they’re doing. They tug at our heartstrings, unravel them, then tie the loose ends into knots. The untangling is fraught, delicate work. Choi pulls no punches and her topics include but are not limited to: absent fathers; disappointing, damaged, single mothers; sexual assault; unintended pregnancy; substance addiction; depression; and the slow suicide by poison that happens when anger is nurtured. Emergency Contact is beautiful inside and out, all pink and black and rose gold. Penny and Sam inspire and comfort each other, feeling their way to a rapprochement with adulting one mistake at a time, in search of their person and their tribe.